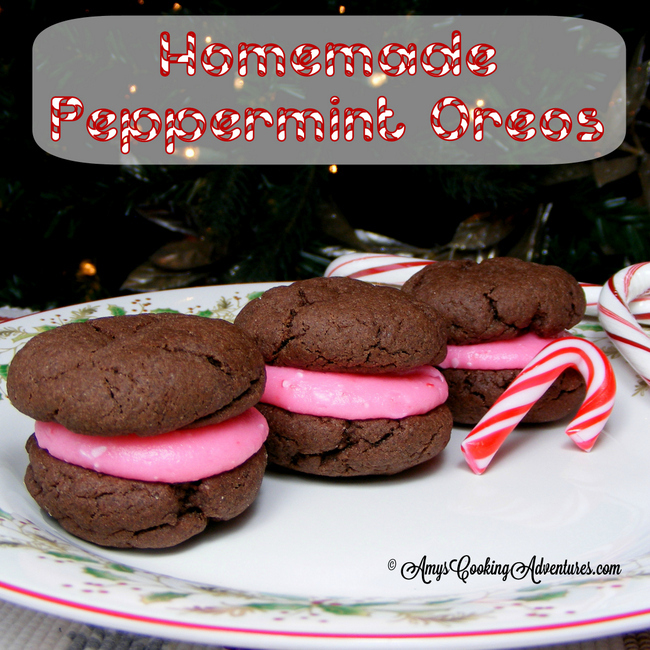 Google Amy's Cooking Adventures: Homemade Peppermint "Oreos"
*This recipe is easily halved, though you may end up with one spare cookie! *I ended up with extra filling/frosting. Use it on cupcakes or graham crackers (chocolate graham crackers?) for a festive snack or freeze it for later use. *If you’d rather not pipe the filling, use a knife or frosting spreader to spread the filling instead. To make the cookies, preheat the oven to 350 degrees F and line baking sheets with parchment paper or a silpat. Place the cake mix, eggs and oil in a large bowl and stir to combine (you may also use a mixer set to low speed). Stir until all of the flour has been absorbed. The batter will be very thick. I found it best to work the dough in a kneading motion, pressing the dough to the side of the bowl with the back of my spatula. Next, roll the dough into 1-inch balls. I found my 1 tablespoon scoop to be the perfect measuring tool for this. Flatten the dough balls slightly and place them 1-2 inches apart on the prepared baking sheets. Bake for 8-10 minutes or until the cookies are puffy and the tops are slightly cracked. Immediately move the cookies to wire racks to cool. They seem very delicate, but will hold together. Cool completely. To make the filling, beat together the butter and cream cheese until smooth and combined. Add the vanilla extract, peppermint extract, food coloring, and half of the powdered sugar and stir until smooth. Adjust food coloring as desired and stir in the remaining powdered sugar. Fold in the crushed candy canes. Scoop the filling into a decorating bag fitted with a large circle tip and pipe a small amount of frosting onto the bottoms of half of the cookies. Top with the remaining cookies and serve. Store the remaining cookies in an airtight container in the refrigerator for 3-4 days. omg these look so chewy and delicious! Yours look great!!!!! And, I was SUPER excited to send a recipe to YOU! I love this recipe! I will be making on Christmas Eve! I made homemade oreos once and my kids devoured them. I'll have to try the peppermint version, I bet it's delicious!